A few days back, planet Venus passed in front of the sun - those who saw it were lucky as this Venus Transition will not occur for next 105 years. 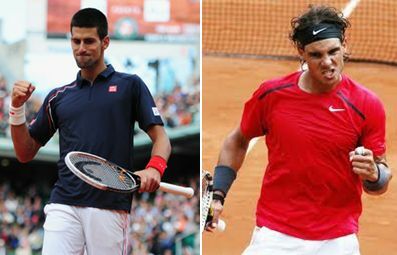 Likewise, on 10th of June, another history making event is going to take place at Paris, when World no.1 Serbian Novak Djokovic and world no.3 and second seeded defending champion Spaniard Rafael Nadal come face to face in the Roland Garros's men's single final. Nadal, who has already won the Roland Garros final for six times, will attempt to defend his title for the seventh time and become the first tennis player in the history of tennis to do so. On the other hand, Djokovic, who already holds three Grand Slam titles, Wimbledon - US Open and Australian Open, will become the third man in tennis history to hold all four Grand Slams at one time, provided he wins against Nadal. It was 43 years ago that Australian Rod Laver had won this honour. Nadal has faced Djokovic for 32 times since they first played the French Open quarterfinal in 2006 - Nadal won 6-4, 6-4 when Djokovic retired. Nadal also won their last encounter at Rome Final recently, when Nadal beat Djokovic 7-5, 6-3. Let us watch the two playing the Roland Garros men's single final on 10th June Sunday on Court Philippe Chatrier.